Our river guide Solomon gave us a few pointers before we shoved our canoes into the Zambezi River and began a three-day, thirty-mile paddle through Zimbabwes Mana Pools National Park. "If you fall out of your canoe and there are hippos nearby, get away from your canoe. If there are crocodiles nearby, get back in your canoe." This wasnt theory. From shore we could see the eyes and twitching ears of a dozen hippos looking right at us. On a sand bar near the hippos an eight-foot Nile crocodile lay sleeping; at least it appeared to be sleeping. Novice canoers might have been intimidated by the Zambezi, but my wife and I were hardly novices. The week before we left home we read a book on canoeing and practiced our strokes in the living room with a pair of brooms while sitting on dining-room chairs set one in front of the other. 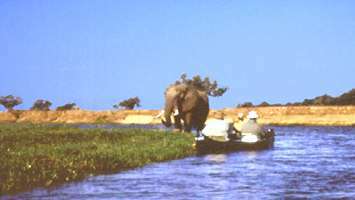 Once we were on the river, we got our "stroking Zen" going and began to relax as we negotiated pod after pod of hippos without incident. Solomons respect for the hippos "space" kept us safe. We would approach them slowly and quietly, and with a thump of his paddle against the side of the canoe, he was usually able to head them for deep water with minimal agitation, but not always. We encountered one pod of hippos at the entrance to a narrow channel that would not be budged. Although there is no whitewater on the Zambezi in Mana Pools, there is a current, and there would have been no turning back if we had started down that channel and run into trouble. Considering it too risky, Solomon had us make a long detour around the pod. At our lunch stop our safari guide John unzipped the case on his .458 Winchester and told us to stay in our canoes until he checked out the area. John wasnt looking just for crocodiles and hippos; lions, Cape buffaloes, and elephants can also be found in the reeds along the shore. Although we were acutely aware of every motion and sound as we headed up the bank, it was hard to stay focused on potential dangers when Mountain Travel Sobek made our surroundings so pleasant. Tables and chairs were set up in the shade of a huge sausage tree and a buffet of cold cuts, salads, and fresh fruit was laid out along with ice-cold sodas. The wind was picking up, and we had miles to go before we slept, so we packed up our gear and pushed off downstream. It was harder paddling, and I was developing a bit of an attitude, until I remembered that adventure travel is just that, an adventure. At Disneyland the "servo-driven" hippos always pop up at the same time and place on the jungle cruise, but not on the Zambezi. Because the "highs" and "lows" of adventure travel are real and unpredictable, theyre much more intense. I will never forget either the hippos or the hard paddling. Toward evening we spotted our camp on the bank above the river and made for shore. As we stepped from our canoes, we were handed hot washcloths and cold beers, another unexpected "high" I won't soon forget. Dinner in the open-sided, candle-lit dinning tent was also a magical moment. While moonlight shimmered on the Zambezi, we dined on Beef Wellington as a herd of elephants moved silently past our table. On day two we were back on the river right after breakfast. The wind was gone, and the surface of the river was as smooth as glass. Pods of hippos came and went; life was good. As we approached our next pod of hippos, they refused to budge when Solomon tapped his paddle. With much puffing, and grunting, and baring of tusks, the hippos had drawn their "line in the sand." To avoid drifting down on them in the current, Solomon instructed us to paddle into an eddy on the upstream side of an approaching headland. "Head out! Head out!" No sooner had Solomon shouted his command, than half-a-dozen hippos charged into the water from behind the headland. Churning the surface of the river to a froth, they submerged beneath our canoes. 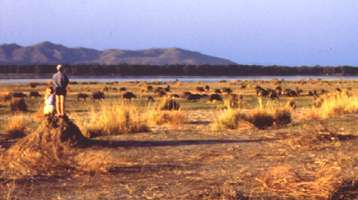 Solomon had spotted oxpecker birds rising into the air above the sand bluff and guessed correctly that they had risen from hippos that had been spooked. Following Solomons commands, we paddled toward the middle of the river and avoided both pods of hippos. While we caught our breath, two large crocodiles, responding to the ruckus and the prospects of a meal, glided past us. Downstream from the hippos John spotted a pack of Cape hunting dogs, and when he signaled for us to head in, we shipped our paddles and drifted silently toward shore. Slipping his rifle out of its case, John motioned for us to keep quiet and follow him. We followed the pack tracks for a couple hundred yards but never caught sight of them again. We were lucky to have seen them at all, because these tactical hunters are more endangered than black rhinos. On our way back to the river we walked along the shore of a pool filled with purple and white water hyacinth. As we snapped pictures, John pointed to where the hyacinth were being parted by an unseen force. While we looked, we spotted more and more movement. The lagoon was filled with crocodiles. After a few more hours of paddling, we pulled into the "take out." Derek, the camp manager, was there with the Land Rover to drive us back to our tents. The canoes would be left on the bank, and he would drive us back down to them the following morning. That afternoon we piled in Dereks Land Rover to explore Mana Pools National Park. The afternoon light was perfect when we stopped to photograph a bull elephant pulling down fruit from a tall winterthorn. Moving on, we spotted herds of impala and kudu. The settings seemed almost pastoral until we ran into a herd of zebra in the fading light. One member of the herd had three foot-long, gaping, red tears in its flank, the result of a failed lion attack. Along the backwaters of the Zambezi Derek locked the hubs of the Land Rover and slithered through the mud to reach a small sand bar, and while we watched daylight drain from the blue hills of the Zambian escarpment across the river, he pulled out the "cold box" and popped the caps on a round of drinks. We began our last day on the river with a hearty breakfast to see us through our longest paddle. Below the "put in" Solomon guided us through a maze of meandering side channels. To preserve its feeling of remoteness Mana Pools National Park limits the number of outfitters allowed on the river and staggers their departures so that no group ever sees another. With no other trace of human habitation our view must have looked similar to that of Vasco de Gamas when he sailed up the Zambezi to Kariba at the end of the 15th century. It was a magnificent winter day, and when we stopped for a picnic lunch, we watched fish eagles in the treetops scan the river for a meal while white egrets and yellow-billed storks strolled among the pink-eared hippos along the shore. After lunch we paddled back into the main channel. With room to maneuver the races began, and those too weak to win resorted to all sorts of treachery to maintain their lead. Soaked and exhausted, we linked our four canoes together, cracked a round of cold drinks, and floated downriver on the current. When we spotted our new campsite high on a bluff, we separated the canoes and paddled for the put-in. Derek had spent the day making Sadza with Beef Stew, a traditional Zimbabwean dish, and while we ate, a lion roared nearby. Our guide John just raised his eyebrows and smiled. The following morning we packed our gear, said good-bye to Derek, Solomon, and the rest of our camp staff, and boarded the Land Rover for the airstrip. 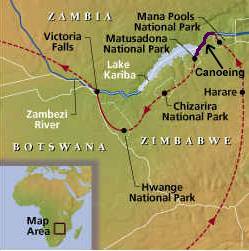 Over the next two weeks we would visit three more of Zimbabwes national parks, before returning to the Zambezi to run its rapids below Victoria Falls. Courtesy: Mountain Travel Sobek [Mountain Travel Sobeks "Zimbabwe Game Tracking Safari" is an adventure that parallels the hunting safaris of old, but trades cameras for guns! It includes three days of paddling the calm, upper section of the legendary Zambezi River by canoe and quietly tracking wildlife on foot through the bush]. 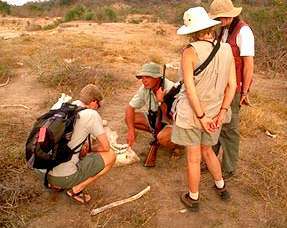 Click here for more information on this adventure or other MTS adventure tours.